To teach your dog how to turn on command, start by holding a lure like a treat or a toy near his nose. You can train your dog to do a lot of cool things, like give you a hug or pick up his toys. But it's also worthwhile to teach him some practical tricks, like how to turn on command. "Turn" can be useful in a variety of situations — everything from changing direction on a walk to steering clear of a dangerous or problematic situation. To encourage your dog to turn, use a favorite treat or toy as a lure. Hold the lure down low near your dog’s nose on the side the dog’s walking on. If your dog is tall enough, you can hold the lure in your hand. For smaller dogs, a spreadable soft treat on the end of a long serving spoon will enable you to walk upright and still hold the lure near your dog’s nose. Introduce the idea of the turn by giving a verbal cue — “turn” — and immediately move the lure in the direction you want the dog to go. Simultaneously, move your own body into the turn to keep the dog in a consistent location next to your side. This teaches your dog to follow your lead and turn in the same direction as you do. During initial training, treat your dog for each small increment of the turn. As your dog starts to understand what you are asking him to do, increase the distance between treats, eventually rewarding him only when he has made the full turn. Keep in mind that a left turn, a right turn and a 180-degree turn will need to be practiced separately, as the logistics of each will vary. For instance, if you are turning left with a dog who heels on the left, use the lure to guide your dog to pivot in place as you move around him to make the turn. If you are turning right with a dog who heels left, you will need to reverse this process: While you pivot in place, use the lure to lead your dog through the turn. As your dog begins to master the turn, work on fading the lure. Give the signal — “turn” — and reward any sign of the dog moving with you. Once your dog responds to the command and turns, reward him with a treat from your pocket or a treat pouch. The goal is for your dog to synchronize his movement to yours when he hears the verbal cue. Start by training in a low-distraction area, like your living room. As your dog begins to get the hang of the turn, move to more distraction-filled areas like your yard or the sidewalk in front of your home. Eventually you can start to practice the “turn” command on walks through the neighborhood. 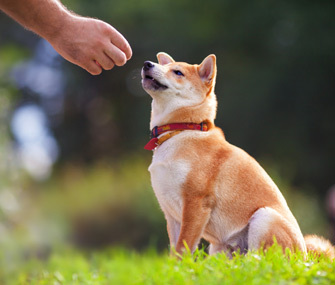 Continue to praise your dog and to reinforce occasionally with treats — this helps teach your dog to respond reliably to the cue, because he never knows when he may get a treat. Should I Have My Dog Heel for His Entire Walk? Why Doesn't My Dog... Want to Go for a Walk?